Ah, yet another reason Amazon ticks me off. There's a special app to create comic books for Kindles. There's one to create children's books. 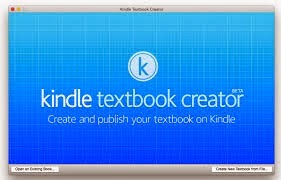 And now there this special Kindle Textbook Creator for textbooks. This is getting old. Amazon is always about Amazon—first, last, and always. The don't care about the troubles their proprietary standards create for authors and publishers. When I queries KDP about creating fixed layout ebooks for Kindles, I was told to hire a third-party company for thousands of dollars. InDesign will let me do that for the iBookstore in about two minutes from an already done print edition. Two minutes versus two thousand dollars.... it's not hard to see who is the author's friend. Even more disgusting, at every retail price but a narrow $7 window, they pay half the royalties that Apple pays (35% rather than 70%). For many authors that's the difference between eating beans at home and taking the spouse and kids out for a meal once in a while. This is sickening. I've written, edited and published dozens of books. I don't want to learn a different app for each kind of book. And I especially don't want my labors of layout and design confined to the Kindle store. Heck, I'll even need to use different software to create a book for Amazon's own Createspace. What sense does that make? I want Amazon to get off it's We Rule the World kick and assign a few of their staff to Adobe's InDesign team a mere 10 minute drive from Amazon's own corporate headquarters. And I want Amazon to make InDesign able to export quality Mobi and KF8 files like it already exports quality PDF/print and both reflowable and fixed-layout files. In short as a author I want Amazon to quite acting like it has been appointed King Fuhrer of the Publishing Universe and expecting everyone to use its special apps and format ebooks just for it. It can play ball like everyone else and cooperate with others. If publishing were a grade school, Amazon would be the fat little rich kid who always gets marked down for "Does not play well with others." In a nutshell: Amazon needs to start acting like one retailer among many. It needs to pay industry-standard royalties to authors and it needs to work with industry-standard tools such as InDesign.